The Doll Sweet Journal. : Kitchen Intervention! I generally don't really care what people do with their houses in terms of decorating styles, cleanliness and organization (or lack thereof), old house versus new house, small house versus big house, etc. One's home is one's own domain and one has the freedom to do with it what one will. (Ooo, philosophical!) It's an entirely personal thing that's a matter of one's taste, style, lifestyle, means, and priority-level. That's all fine and good. However there is one thing I've noticed over the years in some houses that bugs me quite a bit. It involves the kitchen. Fortunately it's not in the majority of kitchens I've seen, but it seems to be happening more and more. I think it's a more recent thing that goes along with the now-big trend of streamlining and simplifying. My major pet peeve when it comes to houses is this: bare kitchen counter-tops. Ugh, how I detest them! All of them, including (supposedly) lived-in houses that are on the market trying to get themselves sold. The kitchen is the heart of the home, so how can the counters be bare and empty? It makes the kitchen look so empty, so devoid of personality, of action, of anything, just a utilitarian room where you might prepare food sometimes. Having things out on the counters is convenient and practical. 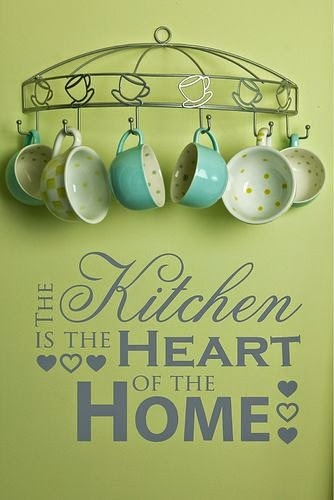 It gives a kitchen personality, filling it in and helping to make it a welcome, happy place to be. When I see bare counters in a kitchen I feel sad for the kitchen and for the inhabitants of the house. I really do! I get a strong desire to undertake a kitchen intervention by going through the cabinets and drawers and arranging things in a nice and practical way on their counter-tops. Voila! An instantly cheerier, happier, more colorful kitchen! These are pictures of my own kitchen. Imagine how bare it would look without these things on the counters! My curated cookbook and recipe binder collection, the phone, hand sanitizer, and of course, an owl. Utensil crocks. So practical and useful! I use these almost every day. The silver one on the left is meaningful; it was a wedding present from a college friend from our Crate & Barrel registry. I like seeing that every day. If I didn't keep my blender out, I'd use it even less than I already do! Household and school binders, iPad storage, and decorative/seasonal items. So if you have hardly anything on your counters, I beg you to take mercy on your poor empty kitchen and reconsider! Even if you have some good reasons for keeping it more on the bare side, just consider the happy effects of putting out a cute utensil crock, a fruit bowl, and your most-used appliance. Saving America's empty, sad kitchens, one kitchen at a time. Someone's gotta do it!